Treat yourself to a deli-style wrap sandwich in just 5 minutes. Get out the tortilla and roast beef and we'll take you through the three easy steps. 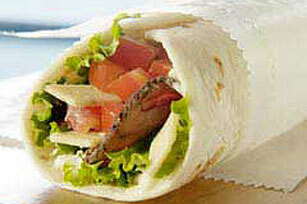 Serve immediately, or wrap tightly in plastic wrap and refrigerate until ready to serve. Spice up your mealtime with these easy-to-make wraps. Serve with your favorite fresh fruit. Spread tortilla with TACO BELL® Refried Beans before topping with remaining ingredients. Top with avocado slices or roasted red pepper strips before rolling up. Prepare as directed, using one or more of the following flavor variations: Substitute 1 KRAFT DELI DELUXE Process American Cheese Slice for the HOFFMAN'S Process Cheese Food. Substitute MIRACLE WHIP Dressing for the mayo. Substitute TACO BELL® Thick & Chunky Salsa for the chopped tomatoes.